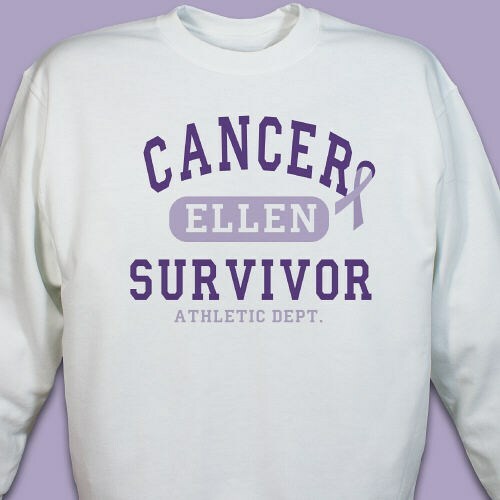 Cancer Awareness Personalized Sweatshirt - Cancer Survivor Athletic Dept. It was a tough road but you are a Cancer Survivor. Share your story so that you can create additional Cancer Awareness while wearing your own Personalized Cancer Survivor Shirt. This is a beautiful gift for your Mom, Dad, Grandma, Brother or Best Friend. Our Cancer Survivor Athletic Dept. - Pancreatic Cancer Awareness Sweatshirt is available on our premium white cotton/poly blend Sweatshirt, machine washable in adult sizes S-3XL. Also available on Ash Gray or Pink. Includes FREE Personalization! Personalized with any name. We are very, very happy with our products that we received. Great quality as always. Thank you so much!!! Additional Info Choose from one of our many Personalized Cancer Awareness shirts. We have many designs to choose from. A portion of the proceeds goes towards the fight against Cancer. Please call us for bulk orders or custom cancer awareness shirt designs.